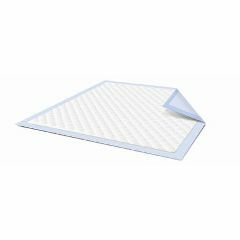 Prevail Underpads - 30" x 36"
Tendersorb Underpads - 23" x 36"
Tendersorb Disposable Underpads - 17" x 24"
McKesson Light Underpads for bed or chair protection are designed to cover mattresses in order to absorb leakages, reduce odors and maintain dryness. They consist of a polyethylene layer combined with sealed edges to ensure leakage protection. The highly absorbent material is evenly distributed throughout the core. McKesson Light Underpads are designed for patients unable to use body worn products due to skin irritation and infection. Also used to cover mattresses in order to absorb leakages, reduce odours and maintain dryness. They consist of a polyethylene layer combined with sealed edges to ensure leakage protection. The highly absorbent material is evenly distributed throughout the core. McKesson Light Underpads underpads use 100% virgin fluff pulp, which provides far greater levels of absorption and retention than draw-sheets or wadding-filled pads. Unlike other incontinence products that require washing and are very expensive, these sheet protectors are completely disposable and very cost effective. The McKesson Light disposable underpads also offer the added benefit of a smooth side to help in patient transfer and repositioning! Each McKesson Light underpad features enhanced fluid dispersion, helping to keep it from overflowing or seeping through. The interior liner of these disposable bed pads is soft to the touch, vented to keep cool, and non-irritating to the user’s skin. The outer barrier is soft and smooth, assisting you with repositioning and/or transferring your patients. StayDry Light disposable underpads are available at different levels of protection, with Light Pads for light wetting and Regular for slightly more absorbency, and Ultra and Breathable for the maximum absorbency. These are Light underpads. I am using this an an alternative to puppy pads. It works well and prevents leakage onto floor. It is also larger than the standard puppy pad, which is a plus. The only negative--AS A DOG OWNER-- is that the plastic backing isn't a bit stiffer, so the dog shifts the pad around more easily than with her regular pads (but a stiffer pad probably would not be good for humans!). Very light . I use these pads when I am on vacation to make it easier for the pet sitter . She can dispose of them easily . And my guinea pigs don't eat them . That's a plus .Very happy with this product . Does not tear appart. Protective. Breathable. 1000 different Uses. Office. Travel. Emergencies. Daily Use. Home. Mom. Caregiver. Long Term User. I have a child confided to the bed. I was really impress with the quality of this under pad. I have been using several different brands and types for over a year. I have not found anything that matches the quality or cost. This pad really stay together.